Are you the type of person that gets ‘hangry’ between meals? If so, this list is for you! This list will provide snacks that you not only look forward to but are even healthy. So no more Mr. or Mrs. ‘hangry,’ just whip up one of these delicious snacks. In this list of the best snack ideas, we have compiled a variety of quick and easy snack ideas. So regardless of your taste preference or time availability, you should be able to find a few snacks on this list that work for you. Are you looking for more food-related lists? Visit our list of the best cooking blogs and lunch ideas for kids. For an easy, protein-rich snack try making a parfait. Just mix in fruit, a dash of honey, and granola into some nonfat Greek yogurt, and voila, you have yourself a delicious parfait. 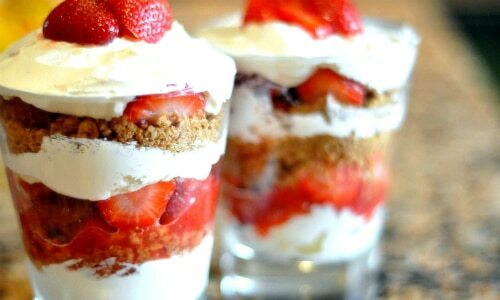 The great thing about parfaits too, is that you can get as creative as you want with them. So mix and match fruits, granolas, yogurt, and more to create your parfait masterpieces. Once roasted, pumpkin seeds are a delicious, on-the-go snack. 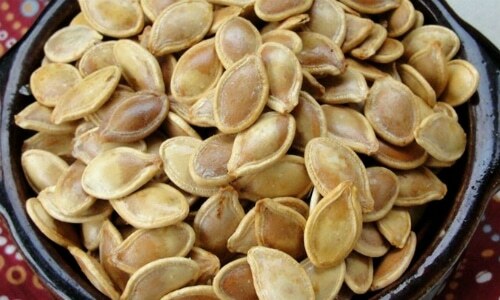 Low calorie and high protein (a ½ cup has 14 grams of protein), pumpkin seeds are great year round. So go ahead, buy that pumpkin! Not just for kids, bagel pizzas are a tasty and satisfying snack. 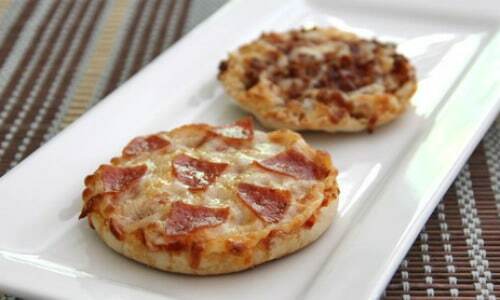 And, if you have a toaster oven, this pizza bagel snack can be cooked in just minutes. Get creative with your pizza bagel toppings as well. With a variety of excellent tasting topping options, you will be able to keep this snack new and fresh each time. If you have a sweet tooth but don’t want a full-fledged dessert, try snacking on some cut up fruit and fruit dip. 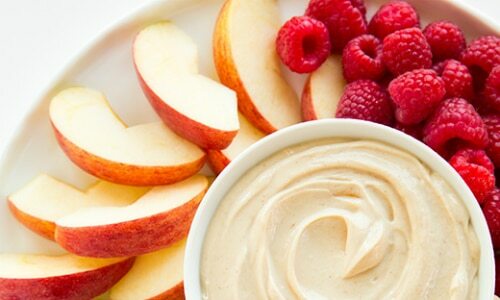 This fruit dip recipe only calls for three ingredients (peanut butter, Greek yogurt, and honey) and tastes delicious. This tasty snack will leave you feeling energized as well. 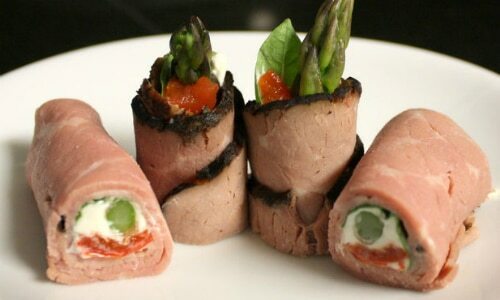 Great for those watching their carb intake, a deli meat roll up is simply rolled up deli meat and cheese. For more substance add some tomato, lettuce, or avocado to the roll up. A variety of cheeses and meats work well for this snack, so try out some combinations until you find your favorite. For a spin on the traditional cheese and crackers plate, try adding some thinly sliced green apples or hard salami to the mix. Triscuit also has some great topping ideas for crackers, turning ho-hum into yum. With all of these different variations, this is a snack that you will be able to come back to regularly. There are a few different ways that you can make monkey toast, but all are delicious. Start with peanut butter and banana as the base, and then from here, you can get creative. You can add chia seeds, honey, granola, and whatever else piques your interest. If you are a fan of the traditional peanut butter and jelly sandwich, you are going to love this snack idea. Any time you can satisfy a snack craving with something healthy that you enjoy, it is a win-win. Veggies and hummus are going to be that perfect snack. 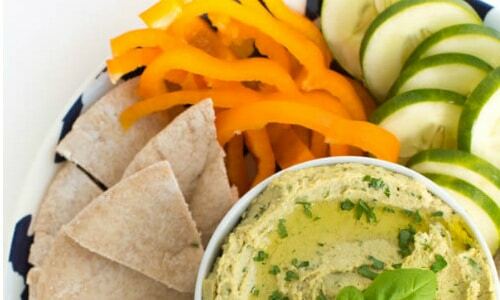 This garden vegetable hummus recipe is not very difficult to make either. With a few herbs and simple ingredients, you will have a delicious tasting hummus that will be able to meet all of your dipping needs. So pick out your favorite vegetables and have some of this tasty hummus on hand to satisfy your snack cravings. 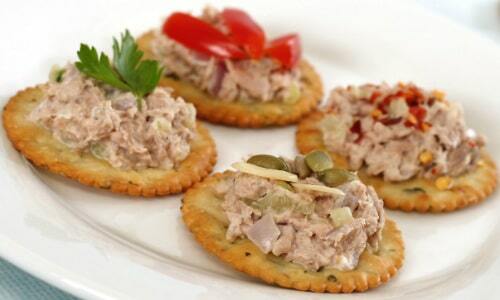 Tuna fish on a cracker is another very customizable snack. This recipe is going to provide a tasty tuna fish recipe, but it will also allow you to add extra toppings. You can decide between different vegetables, garnishes, and seasonings to give your tuna fish that extra pop. The other great thing about this snack is that it is going to be both filling and good for you. 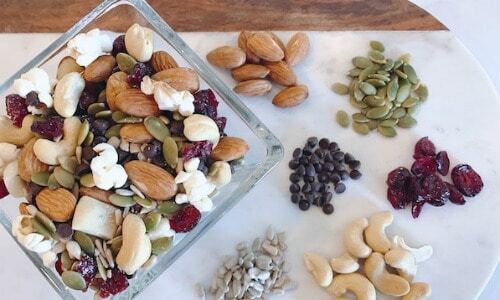 Primarily made up of nuts, seeds, dried fruit, and even chocolate, this trail mix will allow you to pick and choose. You will be able to add in your favorites and leave out the rest. Also, all of the ingredients in this trail mix snack are going to store well. So instead of grabbing a bag of potato chips to satisfy your snack craving, have some of this trail mix ready to go. You will not only be able to satisfy your need for a salty snack, but you will also know that you are eating something healthy. 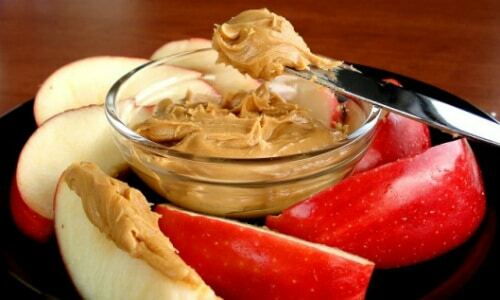 There is just something about the combination of apple and peanut butter. The juiciness of the apple pairs perfectly with a smooth or crunchy peanut butter. This is a great snack for satisfying a sweet tooth craving as well. You may even want to consider a little Nutella on your apples as well. So pick out your favorite type of apple and enjoy this snack on a regular basis. Sometimes you just need something warm and gooey to snack on. Cold snacks are great, but sometimes something hot is the only thing that is going to satisfy a snack craving. 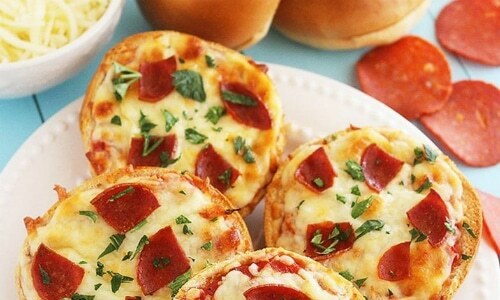 These English muffin pizzas are going to be the perfect option. And, not only will they taste great, but they are also easy to make. Place sauce, cheese, and your favorite toppings on English muffin bread, and then toast. It is that easy to enjoy a hot, delicious snack. 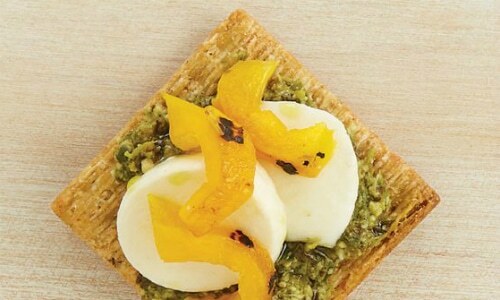 Also, with a variety of different toppings options, you will be able to keep this snack new. Not just for breakfast, this egg and avocado toast recipe is going to make an excellent snack any time of day. With a couple of different options of how to prepare your eggs as well, you can mix up this snack from time to time. 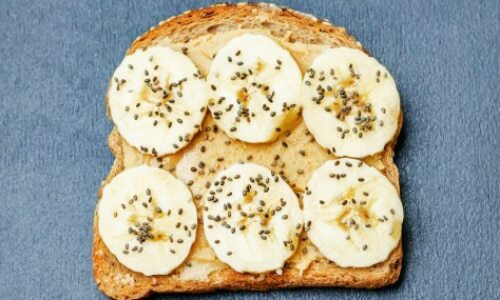 With a whole grain toast, this protein-rich snack is going to give you the energy that you need for the rest of your day as well. 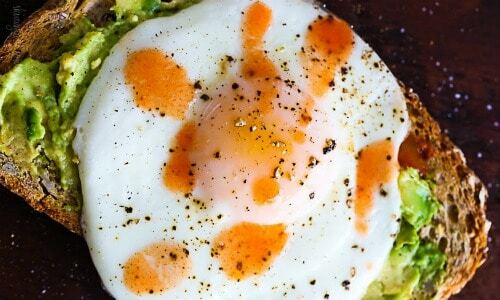 So for breakfast food at any time of the day, give this egg and avocado toast recipe a try. If you love the traditional peanut butter and jelly sandwich, you are going to love this snack. Instead of using bread, this snack is going to call for a wrap. 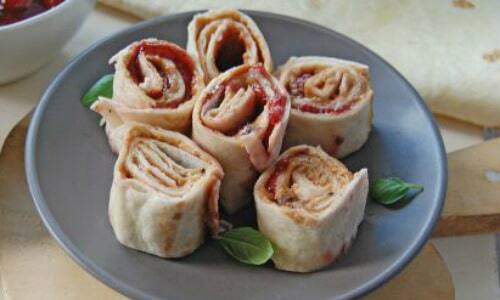 And after spreading out the peanut butter and jelly, you are going to roll up the wrap and then slice it. The end product is going to be bite-sized pieces of peanut butter and jelly wrap. 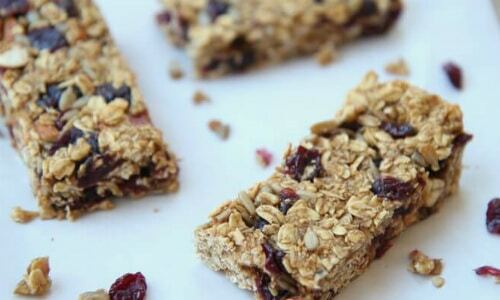 While some store-bought granola bars would make a good snack, a lot of them are either full of sugar or overpriced. This homemade granola bar recipe is going to solve both of those issues. It will also allow you to have a tasty snack that you will look forward to. And, since you are making it yourself, you can get creative with your ingredients and mix and match. If you are craving a salty snack to munch on but find traditional pretzels bland and boring, this recipe is for you. This seasoning will bring your pretzels to life and give them the added kick that they need. Be warned though; they can be highly addicting. 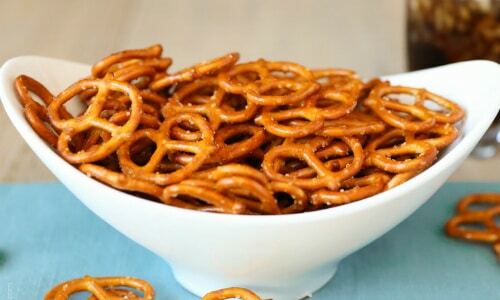 So whether this is a snack on its own, or a side to your favorite sandwich, these seasoned pretzels are a great option. Peanut butter goes well with so many things, but bananas have to be up there with some of the things it goes best with. 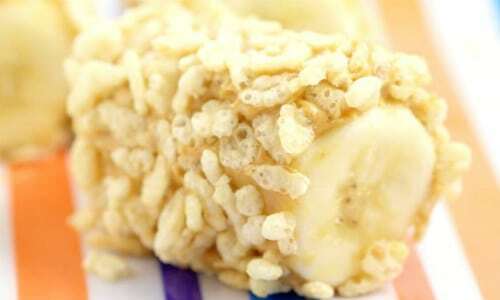 This snack recipe is not only going to combine peanut butter and bananas, but it is also going to coat them in rice Krispies as well. This snack is going to allow you to eat bananas like never before and will be a regular after giving it a try. And, with very minimal prep time and the ability to make and then eat later, this banana cereal snack should be at the top of your snack list. This snack will bring you back to your childhood, but it will be a tasty trip down memory lane for sure. 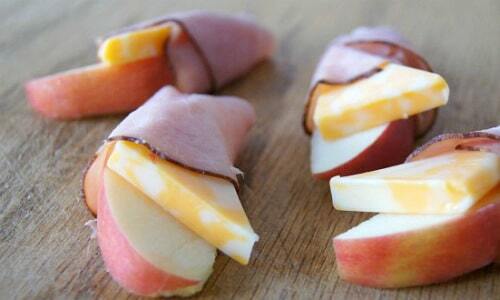 Apple and cheese are going to make up the insides, while a slice of ham is going to make up the outer wrap. Don’t let the simplicity of the snack take away from the flavor that comes with it. These three simple ingredients combine for a great tasting snack that you will want to come back to regularly. Also, try adding some of your favorite crackers to go along with this snack for even more substance. 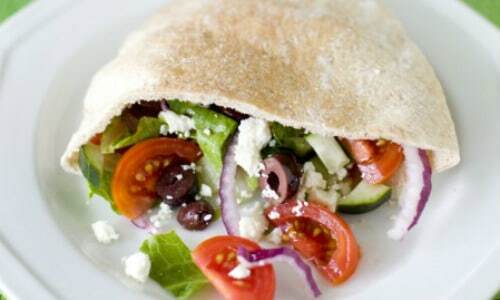 If you are tired of sandwiches, pita pockets are an excellent alternative. This snack is going to allow you to pack a mini pita pocket with a variety of tasty ingredients. And, while this specific recipe calls for a Greek salad as the filling, you can use whatever you would like. If you have a favorite salad or list of ingredients that you would like to try, go for it. There are no rules for what has to go into your pita pocket. Another excellent peanut butter snack idea. 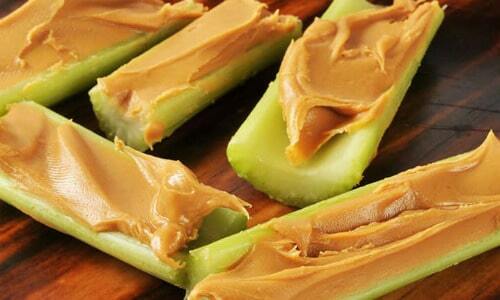 Celery and peanut butter combine well on its own or with added ingredients. From raisins to honey to whatever else you would like to add on, this snack is easy to make and also great tasting. So grab your smoothy or crunchy peanut butter and a couple of stocks of celery, and you are ready for a tasty snack. This snack is so tasty that you are going to think it is a dessert. The strawberries, cream cheese, and toast all combine for a snack that has a ton of flavor. 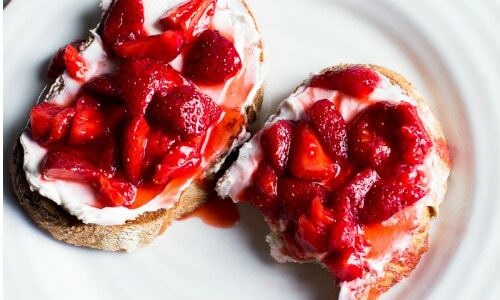 And, with the ability to prepare the strawberry spread ahead of time, this snack is as easy as toasting bread and then spreading on cream cheese and strawberries. So if you are in the mood a snack that is a little bit sweeter, give this strawberry, cream cheese, and toast snack a try. 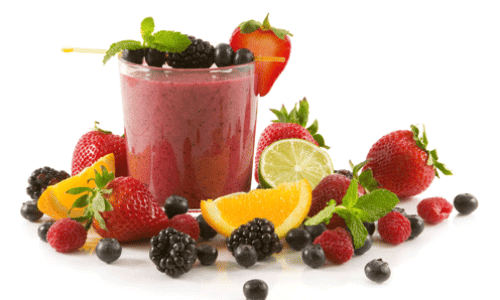 A smoothie doesn’t have to be just for breakfast – smoothies are also a delicious and healthy snack. They are also a snack that has a lot of variation as you can rotate through different smoothie recipes. And, since most smoothies are full of fruit and veggies, you can get your recommended servings of fruit and vegetables blended right into this snack. 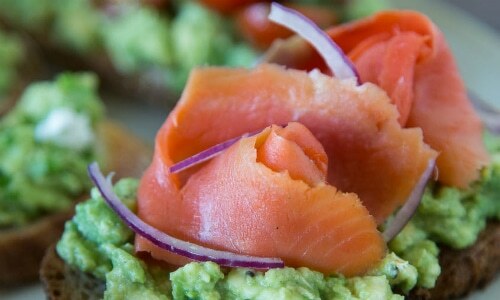 Creamy and full of omega-3 fatty acids, avocados taste great topped on just about everything. For a quick snack, however, try these different avocado toast recipes. For a little bit of extra flavor squeeze some lemon juice on the mashed avocados. An often overlooked vegetable, edamame is full of protein and requires minimal preparation. 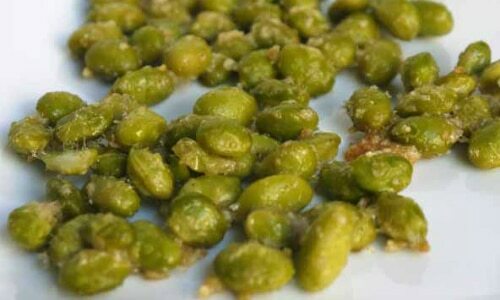 For a healthy and crunchy snack try shelling some fresh edamame and steaming them for around six minutes. A dash of salt makes the edamame just as good as popcorn or chips. Cheese quesadillas are delicious in their own right. With the addition of a crunchy, thinly sliced green apple though, they become even tastier. 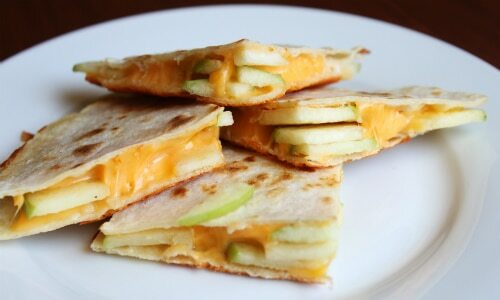 Try this apple and cheese quesadilla recipe for a great snack. And, for even quicker preparation time, keep grated cheese on hand. The perfect snack at the right time can be heavenly. It will help to instantly remove your hunger and hold you over until your next meal. This list provides a variety of great tasting snacks that are going to be able to satisfy your hunger needs. 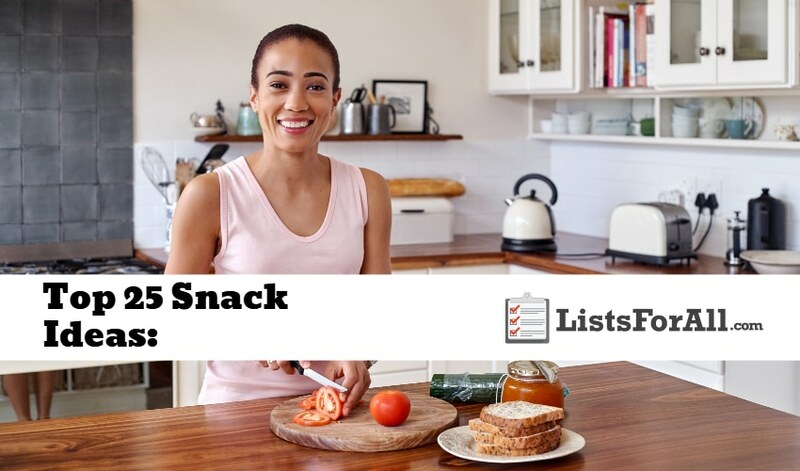 And, with all of the variety on this list, even the pickiest of eaters will be able to find a couple of snacks that they would enjoy. So start trying out some of these snacks and then let us know how they turned out for you in the comments below. Is there a snack idea that you love that you think should be on this list? If so, please feel free to share it in the comments below.